Our typical evenings aren’t too different from most families. On any given night we’re usually eating at the kitchen table, not the dining room one. It’s too far removed from the kitchen, feels too fancy, and quite frankly it’s a carpeted room and I don’t want to clean up food off the floor at the end of the meal. I get home each night, make our dinner, which I try to plan out at the beginning of the week, and then the kids clean up after. Since they’ve gotten home from their grandparents’ house I’ve done a better job of continuing what they did in Nebraska and I’ve also done a better job of keeping on them so they do it. To give you some context . . . every summer at the end of the school year, my kids go to visit their grandparents. It’s like summer camp except they work harder and get to sleep in a bed instead of on the ground. After their mother, my wife, Andrea, passed away in 2011, it’s become the tradition that has to happen so that I can continue to work. Otherwise I have nobody to watch the kids. My oldest, Abbi, is 18 now, sure, and the kids came back a lot earlier and she watches them for that very reason, but I didn’t want Abbi, at 16, to have to act like Mom to her brothers and sister. So for 2 summers she went to her Grandparents’ house, too. Our typical evening centers around the meal, the kids will watch a little TV – with it being summer, Abbi turns on Hulu and they watch a bunch of British comedies because there’s nothing on American TV right now they want to watch. Sometimes we’ll have a fire outside and roast marshmallows. More often than not I’ll make a dessert and we’ll eat it after dinner at some point. But when inspiration strikes, I record. It’s really that simple. I have a ProTools setup that allows me to record in my home. I use a “click” track that keeps beat and I have mics that I use that are specially suited for guitar/vocals and high-impact/high-volume, like a guitar amplifier. Friday night I was in that mode. I’ve been working on a song that is, I’ll just say it, is a bit personal. As a result I wanted to get it right and hadn’t gotten it right in over a week’s time. I’d re-recorded it twice. 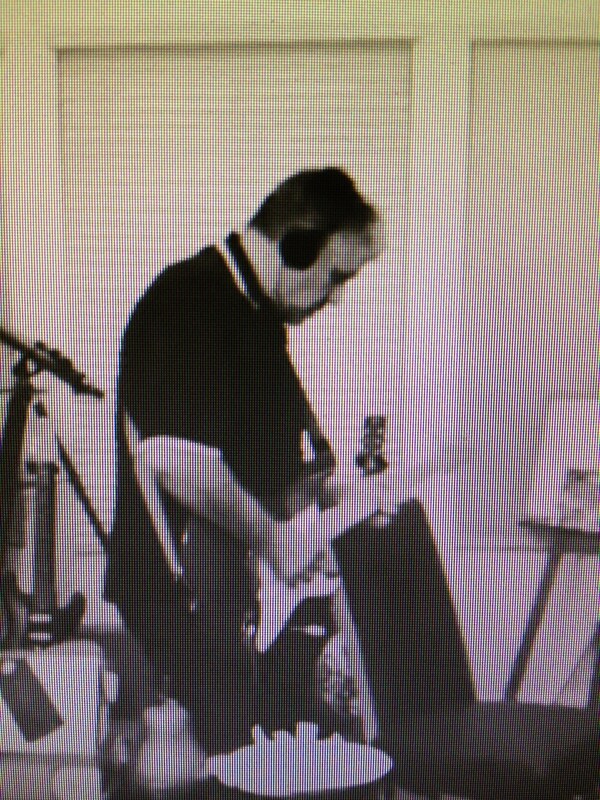 I was on what felt like take 64 when I was recording an electric guitar line with my green Fender Stratocaster, “Dot”. In the middle of the rhythm/lead I was recording I noticed the lights turn on, bright and a bit disconcerting, but I wasn’t going to change what I was doing. I did, they’re battling with Twitter’s “Vine” app and this is how. I hadn’t thought about it until tonight . . . this is normal for my kids. Two to three years ago this would never have happened. Oh, sure, I had the ProTools setup, but I would never have done it, not in the evening. My wife barely tolerated my being a musician. My kids . . . well they tolerate it because they have to, I suppose. I’m the Dad, after all. But for them, this is normal. On any given night they might hear Dad belting out a vocal line and hear no music. They might hear a cranked-up “Adamamp” amplifier with a Clapton Stratocaster plugged in and turned to “11”. But for them it doesn’t phase them. These are the things that have changed. My daughter’s friends have visited our home and found it “eclectic” because of the records, turntable, guitars and amps sitting out, like decorator items, in the home. But they all get used. “This is just our home, our family,” is the response my kids give. Their Dad records. I send the demos to my brother. I put together the songs that will likely be the next LP. I have dreams of cutting some of this stuff as vinyl. It may seem a pipe dream, but in today’s world, that’s not so much of a dream any more. Beside that, my kids see me creating and enjoying and I have even had them be a part of it. This is how our lives has turned out and I do the things that help me, the kids, all of us survive. Guitars sitting around and an evening recording session may seem odd to some people, but for us it’s normal. It happens a lot. And who’s to say what’s normal?